Storm Boy is a drama film based on the 1964 novel of the same name by Colin Thiele. Starring Geoffrey Rush and Jai Courtney, it is a mostly well made modern adaptation of the classic Australian story that marginally improves upon the original 1976 film. 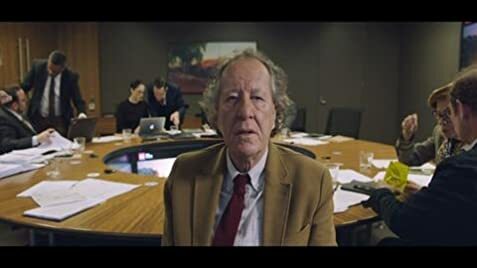 In South Australia, retired businessman Michael Kingley (Geoffrey Rush) recounts a story of his childhood to his grand-daughter Madeline (Morgana Davies). When he was young, Michael (Finn Little) lived with his father Tom (Jai Courtney) on the isolated coastline of Coorong, and was good friends with a local Aboriginal man named Fingerbone Bill (Trevor Jamieson). 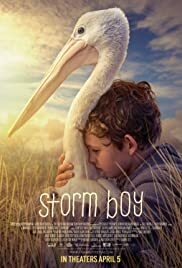 One day, Fingerbone Bill and the young Michael discover three orphaned baby pelicans which Michael rescues and cares for until they grow to full size. Forming a close bond with the pelicans, Michael names them Mr. Proud, Mr. Ponder, and Mr. Percival, the latter of which he becomes the closest with. Perhaps the best told version of Colin Thiele's classic novel, Storm Boy is an entertaining update that is respectful to its source material, even if it does take the occasional unnecessary liberty. The flashbacks to the modern day scenes didn't always work and did end up feeling out of place at times. Thankfully, the ever-reliable Geoffrey Rush playing the older Michael helped make them much more tolerable. However, the moments that occurred in the original story were handled quite well. I particularly liked the scenes where the young Michael was feeding the baby pelicans and teaching them how to fly. This is made even better by the great performance from relative newcomer Finn Little, whose natural playful banter with the pelicans was nice to watch. Overall, this is a fine retelling of the classic novel, if one were to ignore some of the contemporary modern changes.